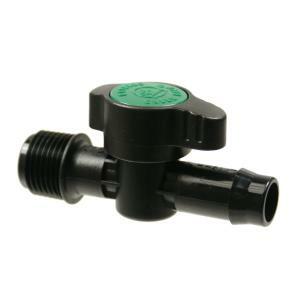 Use this Barb x MPT Flow Control Valve as an On/Off device to control the water flow in low pressure irrigation systems. Valve coupling has 1/2" male pipe threads and a 16mm barb that fits 1/2" tubing with .570 to .620 inches inside diameter. Applications: Irrigation from rain tanks, non-pressurized containers or where 1/2" MPT connection is required.